A well-planned porch area can extend a home's living and entertaining area. 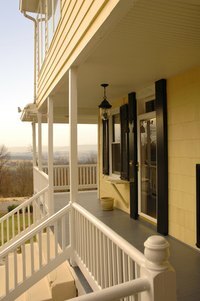 Most families like to use a porch to sit, dine or watch TV during good weather. It's also a good place to remove boots and shoes during rainy or snowy weather. A porch can be designed to store specific items or cut firewood. The overall market value of a house should be enhanced with a good porch design. The roof line of the porch should complement the architectural style of the house, but it should also blend well with surrounding homes in the neighborhood. Purchase a sketch pad to begin the process of creating a porch design. Measure the existing home if the porch is to be added on so that all dimensions of the new porch will fit what's in place. Create a porch to harmonize with a home's design by planning the porch to look as if it's always been in place. Draw the house and porch on graph paper using one space of graph paper to represent 12 inches of real space. Draw steps in the front section of the porch, perhaps ascending to ground level right in front of the home's entrance door. Experiment with steps at either end of the porch as well if this provides needed access to a side yard. Create easy access to the porch area with walk-out double doors from living areas if this is appropriate for the house. Consider installing a sliding glass door to access the porch from the home's interior if the porch is on the back or side of a house. Keep in mind that a roof line of the porch is cruicial for building an acceptable architectural style. Make sure the house and porch roof lines both harmonize on a given structure. Don't use a porch meant for a ranch house, for example, on a French colonial home.